Your nose is running, your throat is irritated, and your head is pounding. You think it's a cold, don't you? Think again; it may be the seasonal flu. It's often quite confusing to differentiate between the two ailments because their symptoms look similar. Even your doctor may have to conduct a flu test to get to a conclusion. Luckily, you can follow some basic guidelines to know the difference between cold and flu. The common cold usually causes a runny nose, sneezing and nasal congestion. It is a viral infection of your upper respiratory tract. It affects your nose and throat and is usually harmless. It can be extremely annoying though; after all, it's not easy to grapple with symptoms like sore throat, sneezing, watery eyes, nasal congestion and cough. The symptoms may vary from person to person mainly because a person may be infected with one of 100+ viruses that cause a common cold. Similarly, the flu or influenza is also an infection of the nose, throat and lungs. Its symptoms are not mild like a cold and sometimes can lead to several complications. If left untreated, one common complication of flu is pneumonia, which usually has serious effects on older adults, children, pregnant women and people with certain health conditions such as asthma or cardiovascular diseases. When comparing cold vs flu,it becomes clear that you can be a victim of common cold at any time of year, whereas the flu spreads in a specific season only and hits its peak during the winters. In both cases, you get infected by being exposed to droplets spread by an infected person. To understand the difference between cold and flu, you have to understand the subtle difference in their symptoms. Different viruses can cause both of these respiratory illnesses, so symptoms vary a bit. Interestingly, cold symptoms start about a couple of days after you are exposed to the virus, and these symptoms usually affect the nose first. Flu symptoms may take only a few hours to appear after you're in contact with the virus. The early symptoms of cold are usually mild, as it starts with slight tiredness and productive cough whereas flu symptoms may begin with body aches, fatigue, dry cough and a fever. Here's the chart to help you be able to tell the differences between cold and flu. For both conditions, taking enough rest and drinking enough water are a must. Stay at home and take some rest, especially during the first three days of catching cold because the cold is contagious and you may infect others. Sometimes, you can use OTC medicines (decongestants, antihistamines and non-steroidal anti-inflammatory medicines) to ease symptoms, but this will not make your cold go away faster. Some people try alternative treatments for colds, such as zinc and vitamin C supplements, but it will be better to talk to your doctor before you try any herbs or supplements. The cold will usually go away within a week or so, but you should see the doctor if symptoms persist after a week, as this could be due to a sinus or bacterial infection for which you need to take antibiotics. Never ignore a nagging cough which could be a sign of asthma. While for treating the flu, you can resort to over-the-counter pain relievers such as acetaminophen and ibuprofen or try decongestants to keep your symptoms in check. You may want to try throat sprays or cough drops for sore throat. Certain anti-viral drugs such as zanamivir or oseltamivir may shorten the length of the flu and prevent other complications such as pneumonia. Be sure to take these drugs as early as possible, usually within the first couple of days of getting sick. 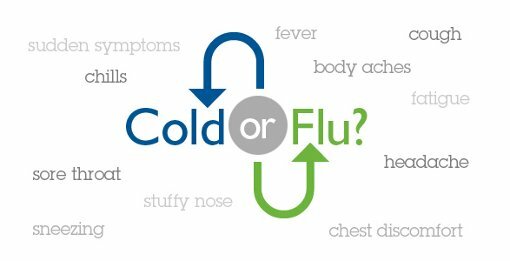 It is important to understand thedifference between cold and fluto find a right treatment routine, but it is equally important to understand how to prevent these illnesses in the first place. Washing your hand frequently is the first line of defense for both situations. This helps slough germs off your skin. Use soap to wash your hands for at least 20 seconds or use an instant disinfectant for good effects. But for preventing a cold, learn to keep your distance from someone who looks sick. Don't share your personal items with them. On the other hand, you should stay at home and don't infect others when you've caught cold. You should also add yogurt to your diet because it contains "active cultures" that may help prevent colds. While the best way to protect you from seasonal flu is to get the flu shot. You should consider getting the vaccine before the start of flu season—this should usually be in September. If you've forgotten, you can still get it in later winter to avoid getting infected.